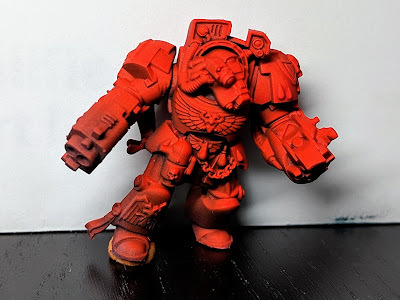 I'll fully admit, I never really 'got' the appeal of Blood Angels... they seemed a little bipolar and they were red... not my favorite color and not an easy one to paint. As a child, back when I still played 40k, Ultramarines were my legion of choice. More recently I picked up an airbrush and attended an excellent class, that I have mentioned before, run by CK Studios. This class really gave me the confidence to get my airbrush out and use it on virtually every model I paint (at least for priming). 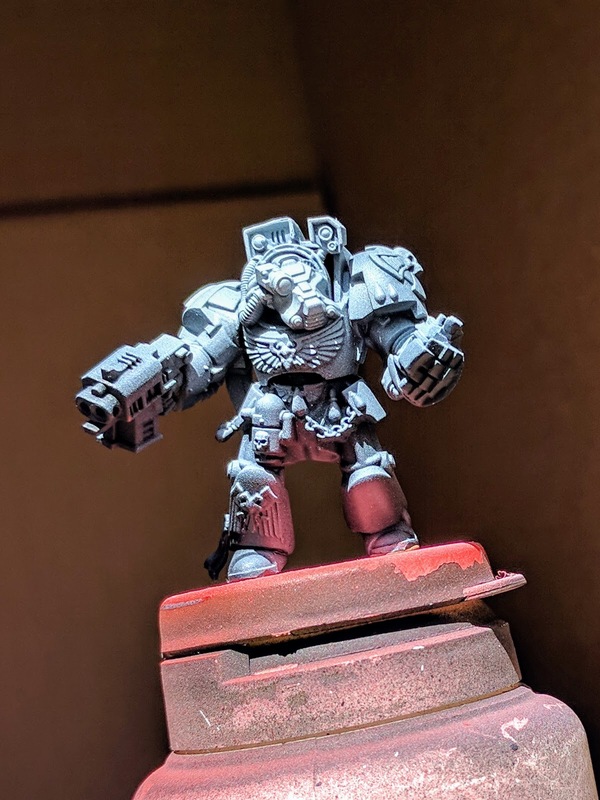 The class had us painting a Contemptor Dreadnought and I decided on using this as a chance to work on my painting of red having encountered a lot of frustration in this area and figured that a Blood Angels Contemptor would help me get tips from our teacher Caleb. The result is a very interesting trick that allows for rapid painting of a true red, with shading and highlight using an airbrush. More recently I picked up Space Hulk and, instead of painting the Terminators in the colors of another chapter as I had originally intended (prob Salamanders), I opted to try this technique to paint up the Blood Angels terminators as the chapter they are meant to be. Part of this was the simplicity of the technique but another big part was that the sculpts are gorgeous and trying to remove the blood drops and angels insignia seemed like a shame (and a ton of work!). 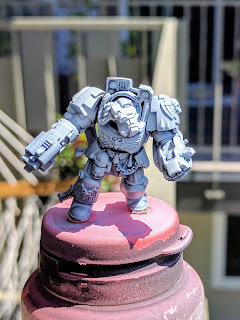 As I was going to be painting more models using this technique, I figured I'd take the opportunity to put a tutorial together as well! 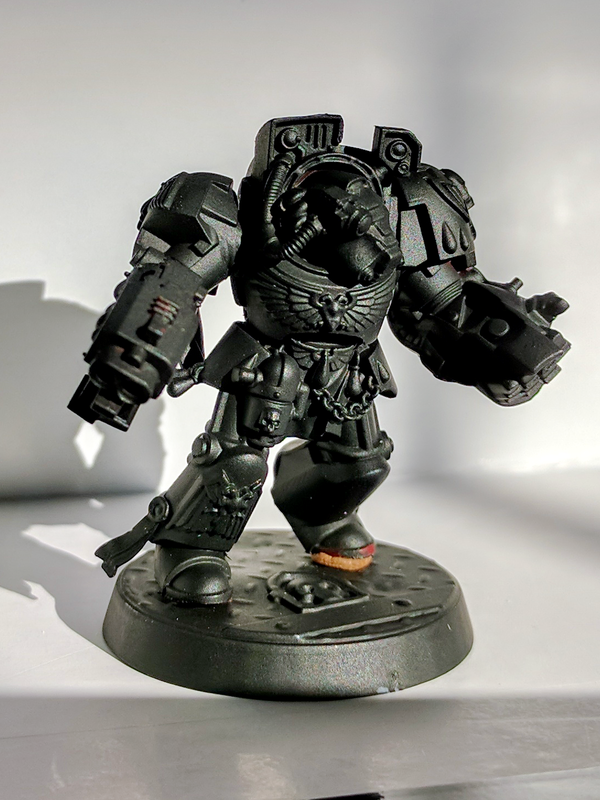 The first step is to do a thorough job priming the model black, the reason for this is that it will form the natural shadows for the deeper recesses of the model. To make this easier I actually primed these models in parts and assembled after the black was laid down. (The orange bit is some poster tack to stand the figure up for the photo.) I use Stynylrez Black primer undiluted to ensure good, quick coverage applied at about 20psi through my 105 Patriot. You may also have noted I opted to use bases for these models so that they can also be used for 40k if I desire (and they don't topple quite as easily!). The bases are 32mm Sector Imperialis bases for that 'metal corridor' look. Having got the priming done, I left them for several days to properly dry (the airbrush primer I use performs a lot better when left to properly cure). I then assembled the terminators to do the zenithal highlight. At this stage I didn't want to have the figure permanently assembled but to give an accurate light cast, the figure should be together (enter more poster tack). Normally I would be relatively light with my zenithal, enough to give some sense of where the light is coming from, in a halo from around 45 degrees around the top, with a counter blast on the face to bring this out as the focus. I use Stynylrez White primer undiluted to ensure good, quick coverage applied at about 20psi through my 105 Patriot. Once you have the white laid down, it's time to drop some red on the model. This is where the cool trick comes in. Because you have a good white base on but still some shadow in there, you can now easily lay down a layer of red that is going to be vibrant and pre-shaded. To do this you want a translucent red that is going to build up over a couple of layers to give the color you want... I know that Daler Rowney FW inks are popular for this sort of technique but for red, Caleb pointed me in the direction of GW's Bloodletter Glaze. I applied this at around 12-15psi, again using my 105 Patriot (it's the only airbrush gun I have so I am not sure why I keep specifying...). This requires a little care as inks are very wet, to prevent beading or runs of the ink, you will want a light touch. Lowering the psi helps as will shorter bursts of more layers. My best tip to know how much paint to lay down (in general but especially in this context) is to spray until it just starts to shine as if the surface is wet and then stop. You will need to do about 3-4 layers of the red to get a nice rich color which may seem arduous however with an airbrush it takes a few seconds to lay down a coat and if you are cycling through a half dozen models then the first should be dried by the time the last is done. Having done these steps, all that remains is to detail the model. I will show more of what I did with this (including some Object Source Lighting) in a later post. Once again, a BIG shout out to Caleb at CK Studios for teaching me this technique and agreeing for me to share it with all of you. Please do give it a try and let me know what you think!